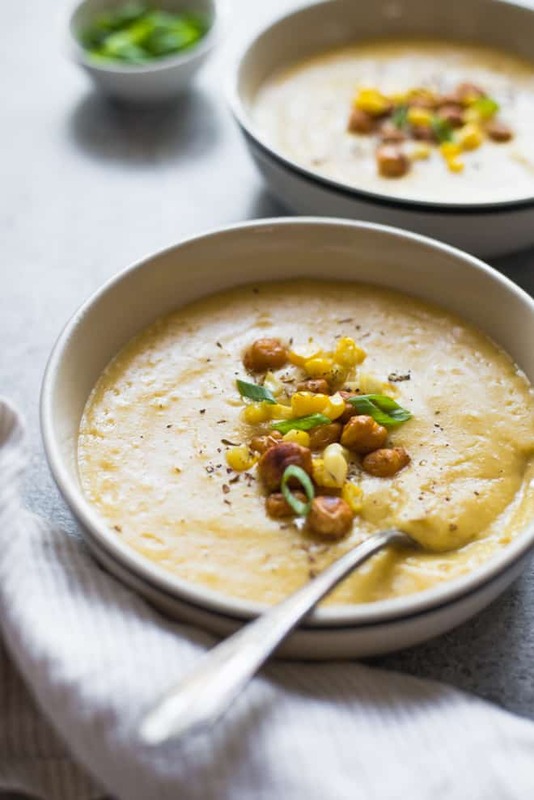 This slow cooker corn and potato soup is the best thing to eat in colder weather. Top with roasted chickpeas for an extra crunch! I know, it’s been a while since I posted my last recipe. After my summer vacation and trip to Austin earlier this month, it’s been taking my brain extra time to get back to speed. And, well, something else happened. I left my day job. For the past year and a half, I had been working as a product manager at a Bay Area startup food company. I never pictured myself working in the food industry after law school. (Actually, I never imagined starting a blog either.) Yet, there I was, learning how to source food products and develop product packaging. And while I loved everyone that I worked with, there was something inside telling me that it was time to move on. Let me just say that all of this is exciting and quite scary for me. Transitioning from a job with steady income to becoming a full-on #girlboss is scary. Yes, it’s great to have more time to work on building my blog and my brand, but trying to figure out how to manage this time is overwhelming. Quite honestly, I admire my fellow bloggers who have all of this together. 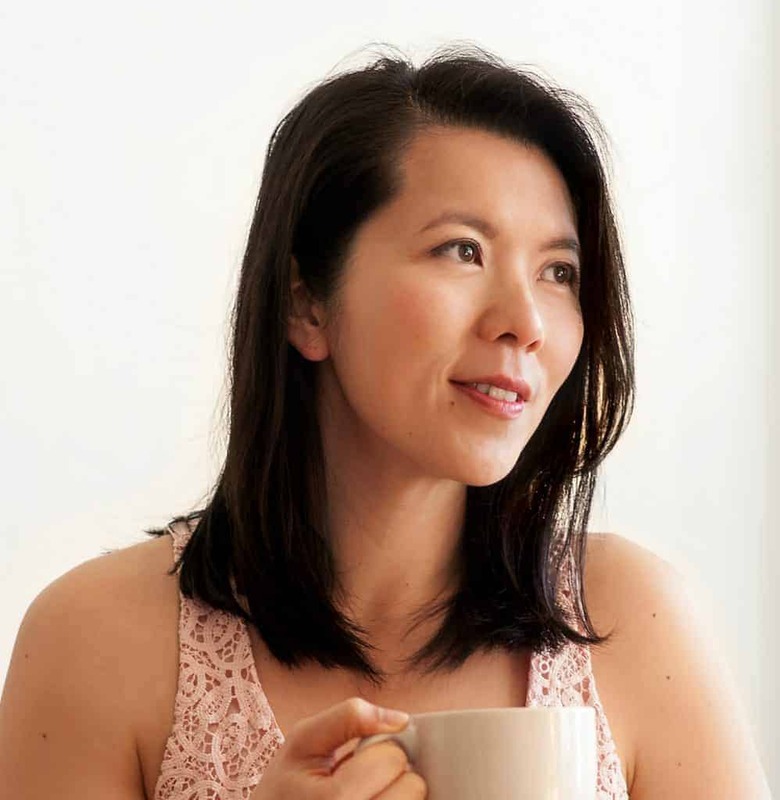 At this point, I can’t say that I have all the answers, but I do have a clearer vision of what I want to do: use my blog to help people become more comfortable with cooking and share recipes that are near and dear to my heart. Over the next year, I will try to create more content around kitchen basics, simple weeknight dinners and Asian recipes. I hope you’ll enjoy what there is to come! Now, on to this corn and potato soup. 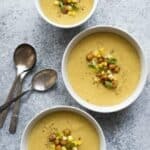 I want to keep cooking with fresh corn while it’s still available, so I decided to make a corn and potato soup—the perfect thing for a chilly autumn evening. I made this soup in a slow cooker, but you can certainly cook it on the stovetop, too. Using fresh vs. frozen corn: This recipe works well for fresh or frozen corn. If you’re using fresh corn, you’ll need about 3 to 4 ears. The soup tasted a bit sweeter when I used fresh corn, which I liked. A note on using fresh thyme: If you are using thyme with tender stems (they’re usually green), don’t bother snipping the leaves off. Just blend them along with the rest of the ingredients. If you are using thyme with woodier stems, you’ll want to snip off the leaves. Leftovers: If you want to store the soup for a long time, pour the soup into ice cube molds and freeze it. Once frozen, remove the cubes from the molds and store the cubes in a plastic bag. When you’re ready to eat the soup again, just melt the ice cubes in a saucepan. Try to eat the soup within 2 months for the best flavor. Add corn kernels, potatoes, broth, water, thyme and a pinch of salt to the slow cooker. Cook on low for 7 to 7.5 hours, until the potatoes are tender. When there is about an hour left on the soup, preheat your oven to 425ºF (220ºC). Line a baking sheet with parchment paper. Pour chickpeas out onto a chopping board and rub them with a paper towel to get rid of some of the moisture. Toss chickpeas in a bowl with 2 teaspoons of olive oil and a pinch of salt and pepper. Spread chickpeas onto prepared baking sheet and bake for 20 to 25 minutes, depending on how crunchy you want your chickpeas to be. When the soup is ready, scoop out about 3/4 cup of corn kernels and set it aside. Blend the soup with an immersion blender or transfer everything into a blender and blend until smooth. Mix the whole corn kernels with the blended soup. 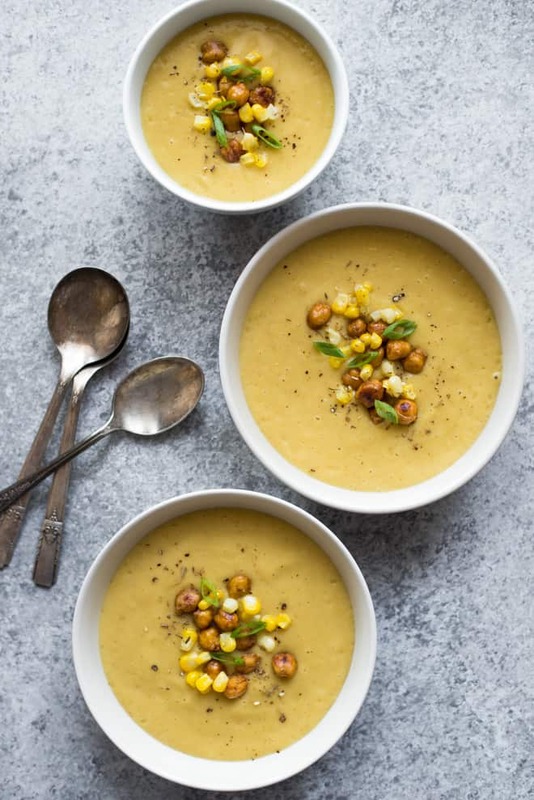 Serve soup with roasted chickpeas. Dear LIsa, nobody ever has it all together!!! Best of luck to you and I am sure you will be just fine! Tatiana, thank you for your kind words!! Just what I needed to hear this morning! I kind of sensed that! Keep smiling! Congratulations on your decision to blog full time. You have created a beautiful space and I can’t wait to see it grow. Congratulations!!! I’m sure now is a very scary time, but one day you will look back on yourself and be glad you were brave enough to try this! I left my job as a web & graphic designer over 10 years ago and had no plan. I just knew it wasn’t working for me. Shortly after, I ended up as in-house IT for a small healthcare company, then took over as systems admin for the same company. I’m no longer at the same company but I am happy with my career and I look back and thank myself for taking that jump! Tracy, thank you so much for your encouraging words! I’m so happy that your leap of faith worked out for you. Thanks again! This is such a lovely colour, I bet the corn and potato are so tasty together too. Like the idea of the chickpeas! 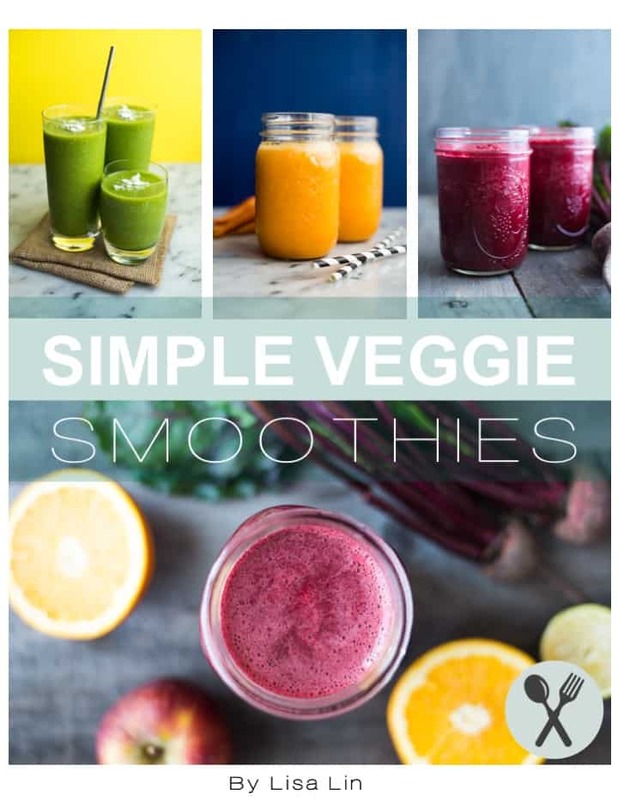 Subscribe to receive my 'Simple Veggie Smoothies' recipe book!